On July 2, 1967, a network of satellites designed to detect tests of nuclear weapons recorded a flash of gamma rays coming from the wrong direction — outer space. And so it was that human astronomers were tipped to the existence of one of the most violent phenomena of nature. Today, they know that about once a day somewhere in the observable universe, an explosion called a gamma-ray burst occurs, releasing more energy in a few seconds than our galaxy does in a year. These magnificent cosmic conflagrations are as far away as they are rare, which is just as well. 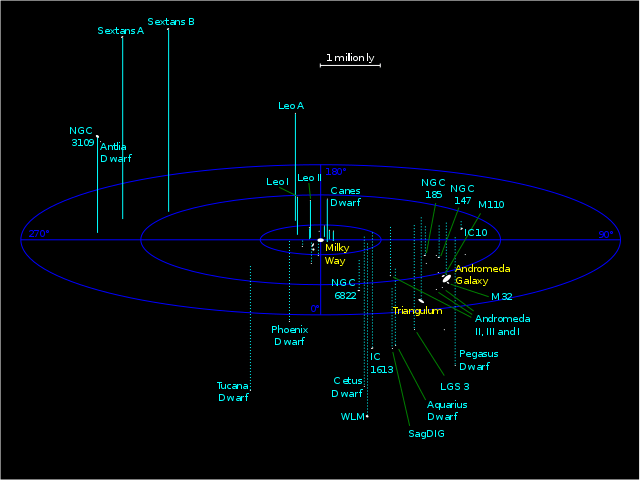 If one happened nearby, in our own galaxy, we could be swathed with radiation. The closest gamma-ray burst whose distance has been measured happened some 119 million light-years from us, far outside the so-called Local Group, which contains our own Milky Way galaxy. The farthest so far recorded is now 31 billion light-years away, as calculated by the mathematics of the expanding universe; it happened when the universe was only 500 million years old. Gamma-ray bursts are thought to be the final step in the series of transformations by which stars shrink and slump from blazing glory to oblivion, winding up as bottomless deadly dimples in the fabric of space-time — that is to say, as black holes. The hierarchy of dead stars goes like this: Stars like the sun, when they run out of thermonuclear fuel, shrink to cinders known as white dwarfs, the size of Earth. Stars more massive than the sun might collapse more drastically and undergo a supernova explosion, blasting newly formed heavy elements into space to enrich future stars, planets and perhaps life, and leaving behind crushed cores known as neutron stars. These weigh slightly more than the sun but are only 12 miles or so in diameter — so dense that a teaspoonful on Earth would weigh as much as Mount Everest. Such an explosion, bright enough to be seen in daylight, happened in 1054, Earth time, as told by Chinese astronomers and the ancient inhabitants of Chaco Canyon in what is now New Mexico. That supernova left behind the Crab nebula, a tangle of glowing shreds of gas and a pulsar — a magnetized neutron star spinning 30 times a second, whipping the gas with magnetic fields that make it glow. Neutron stars, theorists say, are the densest stable form of matter, but they are not the end of the story. According to theory, too much mass accumulating on a neutron star can cause its collapse into a black hole, an abyss from which not even light can escape. The signature of such a cataclysm would be a gamma-ray burst, astronomers say. Supercomputer simulations by astronomers led by Luciano Rezzolla of the Institute of Theoretical Physics in Frankfurt have recently showed this would work. 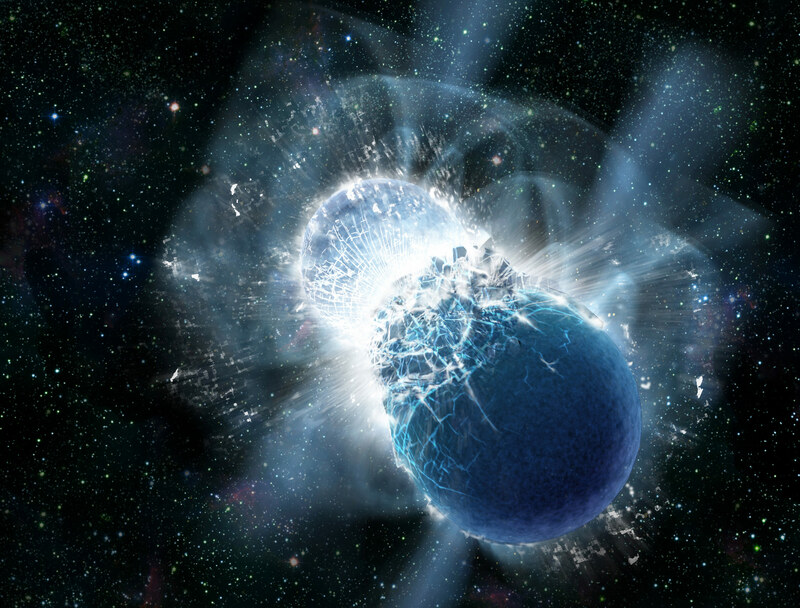 The simulation, as it unwound over six weeks of supercomputer time at the Max Planck Institute for Gravitational Physics, started with two neutron stars orbiting each other at a distance of 11 miles. That would not be unusual in the universe; most stars are in fact part of double-star systems and several pairs of pulsars orbiting each other are already known. They will eventually collide because such dense, heavy objects lose energy rapidly and spiral together. In the case of Dr. Rezzolla’s computation, it took seven milliseconds for tidal forces from the larger star’s gravity to rip apart the smaller star and unwind it into a spiral resembling flaming toothpaste writhing with magnetic fields and begin munching up the gas. The excess plasma forms a fat disk around the new black hole, and its magnetic fields, a billion times stronger than those in the sun, align to channel beams of radiation and particles out at the speed of light. The result is a gamma-ray burst visible across the universe, carrying the news of doom — the last astronomers will ever hear of these stars. For those two stars, the last bang was the best. Oblivion can be such a lovely sight.